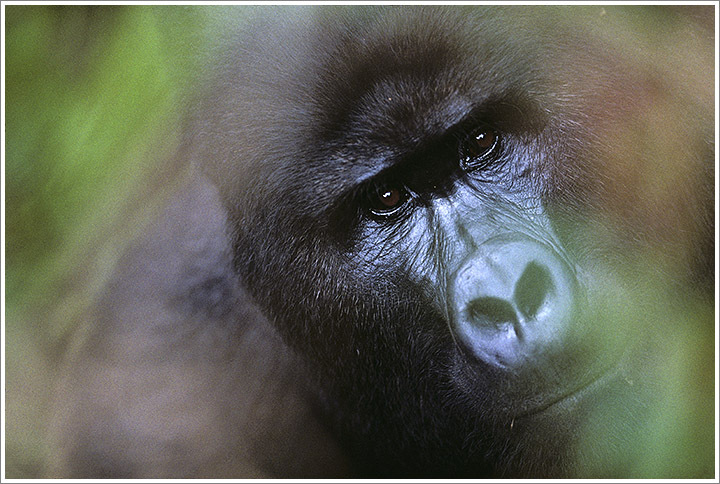 A massive Silverback Mountain Gorilla stares into the camera lens from the edge of a clearing in the rainforest in Bwindi Impenetrable National Park. Photographed November 7, 2004 with a Canon EOS-1 camera and 500mm f/4 lens on Kodachrome 200 slide film. This entry was posted on Sunday, November 7th, 2004 at 5:39 pm. It is filed under On the Road and tagged with Africa, Endangered Species, Mountain Gorillas, Uganda, Wildlife. You can follow any responses to this entry through the RSS 2.0 feed.